Gavin Skelly attempts a free throw. The senior forward scored 7 points in the Wildcats' Big Ten Tournament game against Penn State. 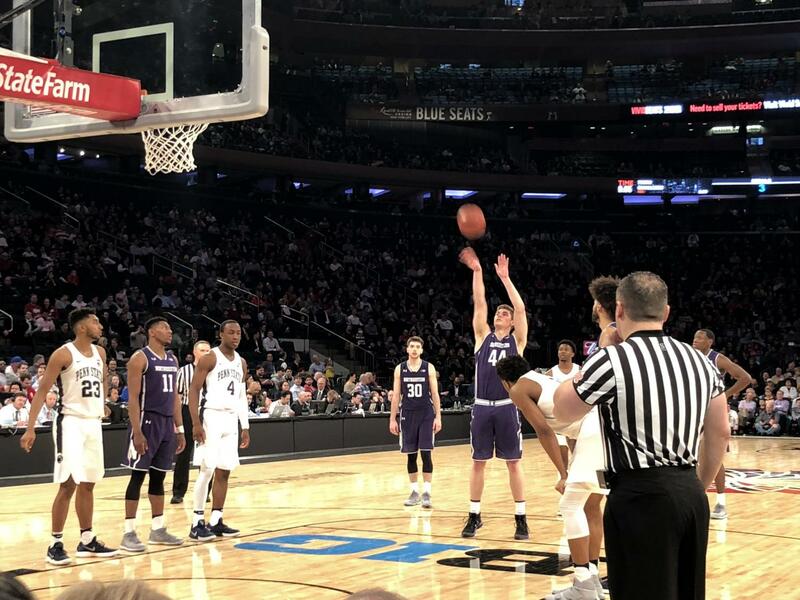 NEW YORK — Northwestern’s season came to a predictable end Thursday night under the bright lights of Madison Square Garden as the Wildcats fell 65-57 to Penn State. Senior guard Scottie Lindsey fouled out on a charge call with 3:15 remaining, Penn State forward Josh Reeves canned an open 3-pointer on the other end to put the Nittany Lions (20-12, 9-9 Big Ten) ahead by 4 points and, on the next Penn State possession, guard Tony Carr splashed a step-back from downtown to extend the lead to 61-54. NU (15-17, 6-12) scored only 3 points after Lindsey’s departure. It was a back-and-forth battle the entire way as neither team led by more than 7 points until the final minute. Both teams were missing their third-leading scorers, as the Cats played without defensive stopper junior forward Vic Law and the Nittany Lions were down Mike Watkins. NU was led by center Dererk Pardon with 14 points and eight rebounds. 1. Second halves are a challenge without any depth. With eight scholarship players active — and only seven given significant playing time after sophomore guard Isiah Brown made a series of mistakes in the first half — the Wildcats once again cratered down the stretch. After sticking with the No. 7 seed through almost 37 minutes of play, everything fell apart in the last minutes as 10th-seeded NU failed to grab key defensive rebounds or close out on open shooters. 2. Tony Carr showed why he was named First Team All-Big Ten. In his previous two games against Northwestern, the star guard struggled, scoring only 20 points on 7-of-23 shooting. But the Wildcats could only keep him at bay for so long. Carr put up 25 on NU on Thursday, scoring 12 of the Nittany Lions’ first 20 points. Carr finished shooting 8-for-20 from the field and 6-for-10 from 3-point range. Carr’s 15 first-half points singlehandedly kept Penn State in the game, and while he was quiet to start the second frame, it was his crucial 3-pointer that changed the game in the end. 3. Chris Collins went down swinging. With Law out, Collins turned to various lineups that had seen little-to-no playing time together all season. The starting lineup, featuring McIntosh, Lindsey, freshman guard Anthony Gaines and centers Pardon and Barret Benson, had not played a single minute together all season before taking the floor at Madison Square Garden. The new lineups were somewhat effective in the first half, as Benson racked up 7 points and six rebounds in the frame. In the second half, however, the team’s lack of depth killed them again. Benson tallied only two points.